My copy of this lovely book is the edition published by UQP and the cover (at left) is so much better than the overseas editions such as the Alfred Knopf (at right) or the Atlantic one (below) with their irrelevant imagery. 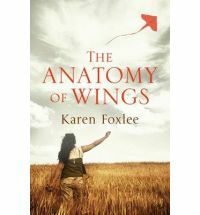 There is no kite-flying or trampolining in The Anatomy of Wings: this lazy kind of cover design makes me really cross and it is penny-pinching by the overseas publishers not to pay the original designer for her much more appropriate work. The UQP design is by Sandy Cull and gogoGingko and it is just perfect: it brings together the psychology of the novel’s narrator through the girl’s posture, her grief-stricken eyes and her obsession with birds. At the same time she faces things head-on, determined not to surrender to a bewildering world. Those rubber-band bracelets symbolise a bond between the town’s bad-girls, the ‘Shelleys’. The bracelets can’t be replicated but only bestowed. In the small society labelled ‘No-wheres-ville’ by the Townsville Twins and the Brisbane Cousins these symbols are as distinctive as female tattoos used to be. Girls, classified as good or bad, know that wearing one of those bracelets means branding for life. The neighbour’s home-schooled daughters who come to offer help wear ‘long-sleeved dresses that reached the floor’ in the same pattern as ‘Nanna’s Butterick patterns from 1974′ (p60). The disintegration of Jenny’s ordinary family in an ordinary town is at its most devastating in the character of Mum. Dad whose beer-belly betrays his solid drinking, leaves the discipline to her, and Jenny’s reportage of her mother’s efforts to deal with the inevitable sibling bickering and minor cruelties is as amusing as her observations of her hapless teachers. But when Beth’s behaviour escalates, and worst of all becomes common knowledge in the town, Mum is at a loss to know how to handle this wayward daughter of hers. Ineffectual as these parents are, their pain is palpable because they love this self-destructive daughter and will do anything to get her back on track. They may be limited in their vision for what their kids could be, but these are not stultifying parents trying to mould their daughter into a life that doesn’t suit her; if she is rebelling against anything it is the town and its limited horizons, not her loving parents. They are parents who can see that the girl is lost and doesn’t know what she wants and has dug herself into a hole from which there seems to be no escape. After Beth’s death Mum stops wearing her striking lipsticks and setting her hair with curlers. After a time she retreats to her bed and ‘wouldn’t budge except to go to the toilet and sometimes make herself a cup of tea. She didn’t have any showers. She smelt like tears. (p110). Foxlee’s depiction of grief is one of the most powerful I have read, and it is a relief when a crisis shocks her back into life and brings some reprieve. The Anatomy of Wings won the 2008 Commonwealth Writer’s Prize for Best First Book (South-East Asia/Pacific Region) Winner, the Dobbie Literary Award for a First Published Woman Writer Winner, and the Queensland Premier’s Literary Award – Best Emerging Author. In some places it seems to be classified as YA, but it would be a pity if adult readers passed it by. Highly recommended. I do hope that Karen Foxlee is writing another novel. Luise Toma at MC Reviews found that the novel has a ‘captivating beauty and has a rough and poetic element that makes it truly unique’. The review at The Guardian is rather brief. HI Becky, this is a much better written book than Jasper Jones, which was too flawed by its improbabilities to work for me. But this, as a forgiving portrait of an unforgiving town captures the milieu perfectly.